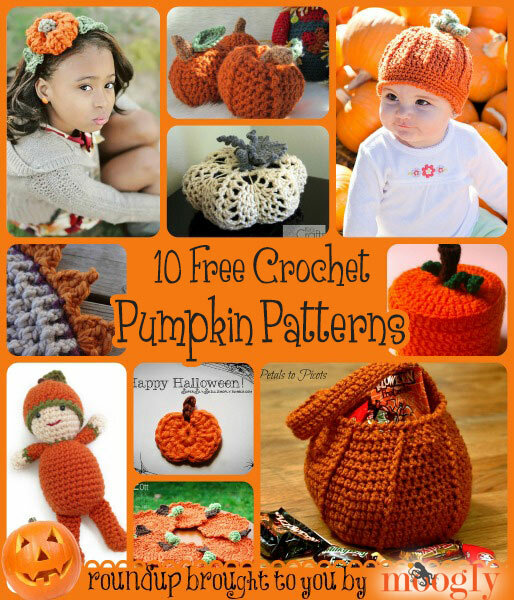 Crochet Pumpkin Everything... aka Free Crochet Pumpkin Patterns! 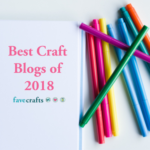 It’s the season of “Pumpkin Everything!” From Pumpkin Spice lattes to donuts, air fresheners, beer, and well… the entirety of Pinterest… the love of Autumn has taken on a decidedly orange hue. 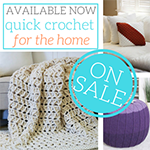 And crochet is right in the thick of it – after all, nothing is better than cool nights to crochet by. 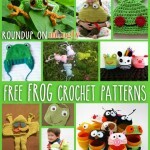 So here are 10 free crochet pumpkin patterns that will have you right on this delicious trend. 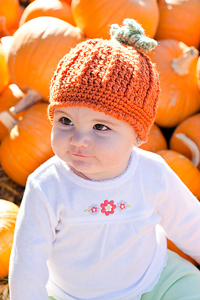 Cute Pumpkin by Teri Crews, a Ravelry download: Love the details on this super popular pumpkin pattern! 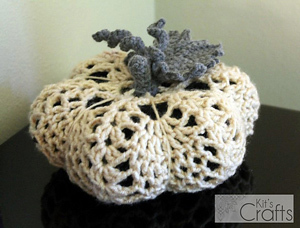 Doily Pumpkin by Kristin Baird, on Kit’s Crafts: This is a very different sort of crochet pumpkin – I like it! 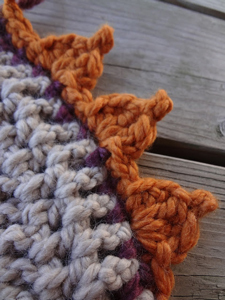 Pumpkin Patch Crochet Edging by Jennifer Dickerson, on Fiber Flux: This is so clever! 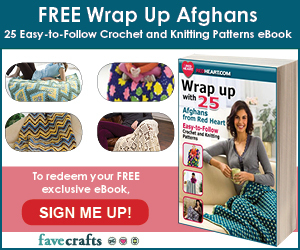 Add a pumpkin-y touch to any project – fabric or yarn! 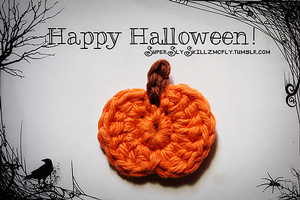 Tiny Pumpkin Applique by Renelle M. Legos, a Ravelry download: So cute! 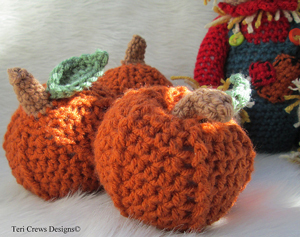 Perfect for adding a little fall to your crocheted garments and accessories. Pumpkin Harvest Hat by Cathy Kurtz, a Ravelry download: There are probably a dozen different pumpkin hat crochet patterns out there, I like that this one has instructions on changing it to different sizes. And the details are great! 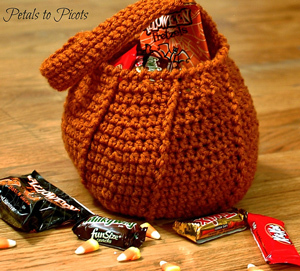 Halloween Pumpkin Trick or Treat Bag by Kara Gunza, on Petals to Picots: Love the shape of this bag – and without the handles it makes a great fall basket too! 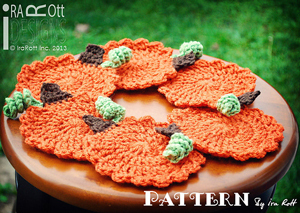 Crochet Pumpkin Coasters PDF Pattern by Ira Rott, a Ravelry download: Set the table in autumn splendor! 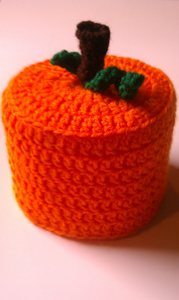 Pumpkin Toilet Tissue Cover by Krystle Hamm, on Virtuous Loops Crochet: Halloween is a little bit kitchy – why not go all the way? 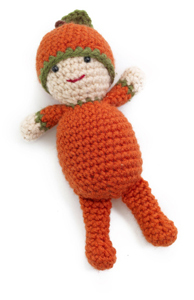 Patrick the Pumpkin Boy by Lion Brand Yarn: A super cute gift for baby’s first Fall! 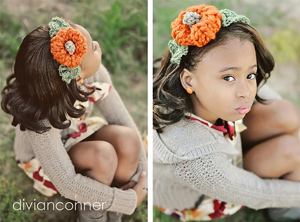 Pumpkin headband by Tanya Bernard, a Ravelry download: Isn’t this gorgeous – great detailing, and just too fun! 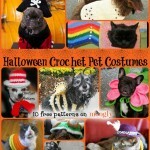 So have you jumped on the pumpkin bandwagon yet? Had your first pumpkiny beverage? 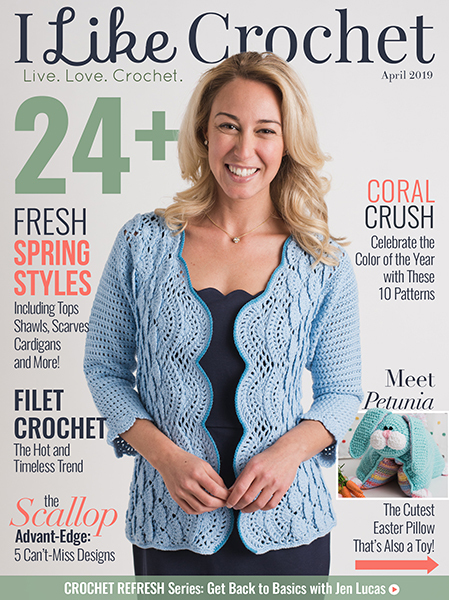 Crocheted anything orange? Share your thoughts in the comments – I read every one of them! Thanks Kara! I love the design! 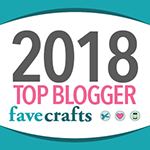 Thanks so much for sharing the love and showing off my Doily Pumpkin! 😀 You’re very welcome Kristin! 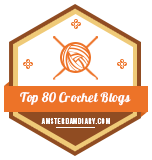 Thank you for featuring my little pumpkin appliqué! This was a great post too. 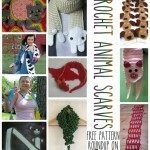 I might have to make a few or all of huge things you linked! 😀 You’re very welcome – and thank you Renelle! 😀 Thanks lori! Glad you like them! 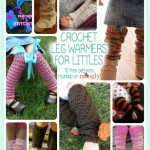 Thank you so much for sharing your beautiful work!! 😀 Thanks so much Lynette!